In order to get the car to a shell the interior needs to come out as well. That is pretty much there except for the steering column and pedals. The steering column is in two parts. The pretty bit on the outside and the steering gearbox shaft on the inside. The two stage process needs to remove the outer shell, then the inner workings. The engine needs to be out really to get to grips with this. But, I suspect there could be movement to get it out if your lucky but I would imagine its a real pain. I am assuming that you have removed the steering rack and everything connected to the steering box. This can be lengthy process and will of course mess with the tracking of the wheels. OK, the first thing is to remove the steering wheel and the horn boss together. that will leave you with the top of the column showing a little something like this below. The switch for the indicators needs to be removed as does contact plate for the horn. Once the switch is unscrewed via a few screws then the wires need to be pulled out from the top to free up the outer column ready for removal. The screws and bolts hold the top part of the column for the centre locating ring just underneath this. I found it easier to undo the lot and take it all off in one go. Once the top colour has been removed move down the shaft to just under the dash where you will find a bracket with two bolts. This holts the column still and in position to the dash. Undo the bolts and remove the bracket. The bracket has a recess and locating point to align it up correctly when re-fitting. Move down again to the bottom of the shaft where you will find a rubber boot that goes to the fire wall to make a seal. This boot will slide up the shaft a little just enough to make sure it doesn’t snarl up on the bottom. In the engine bay you can now grab hold of the column at the bottom above the steering box and push it up towards the dash area. It will move up to expose the inner shaft. Push the outer column as far up as fire wall. Back inside the car grab the outer column and pull upwards and off the main inner shaft. The next job is the steering box itself. 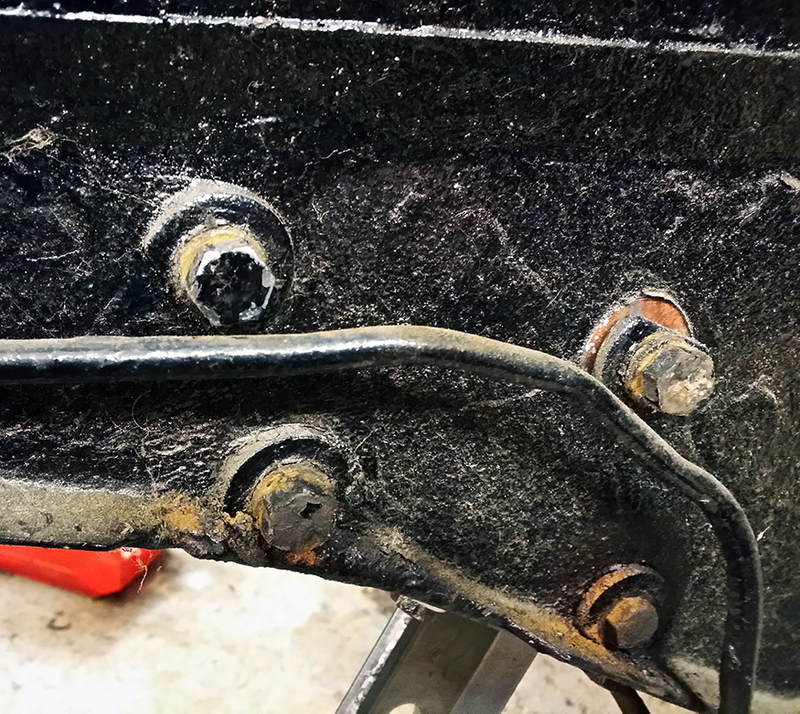 On the outside of the chassis there are three bolts that go through the chassis into the box. Spray with a releasing agent like Gibbs Brand. I went around the three bolts and made sure they were all able to be loosened before I completely removed them all. The top two bolts and the left side bolt hold the steering box, the other is for the steering rack bracket you can just see at the bottom. Once two of the bolts are undone I would suggest holding the box from the other side as well to take the weight of the bolt. Once the bolt is undone you can move the steering box from the chassis. Be careful if you have a nice inside at the inner shaft could catch and scratch the dash area as you remove it. 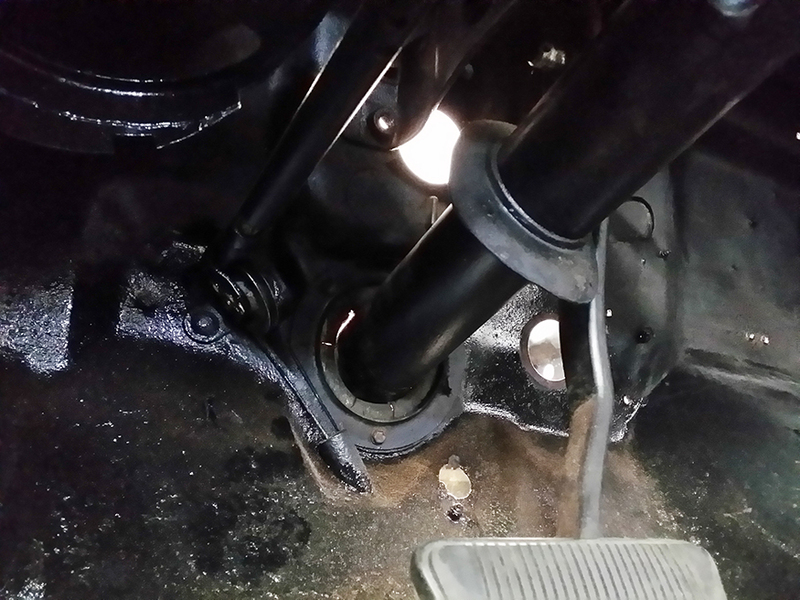 Steering box removed laid along side the outer column case. The steering column at the bottom was horrendously caked in grease, dirt and what ever else was lurking in there. Remove the fire wall seals and put them to one side. In order for the column to look good it has to be sprayed the colour of the interior. To do that I need to remove all the old paint and get down tot the bare metal. 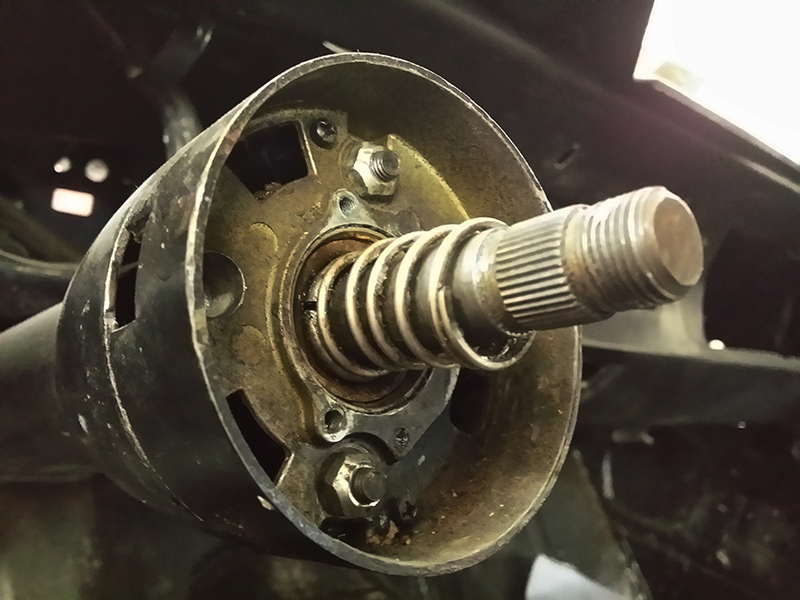 The first job is to remove the rubber seal at the steering box end. This should just pull out but mine wasn’t having any of it. Improvised tool to remove the rubber seal was quite simple, I used some 25mm plastic drain pipe which was inserted the wheel end and was just a few inches longer that the column itself obviously. Turn the whole thing upside down and then tap the plastic pipe onto the rubber bung and it will pop out. The down side is the grease at the bottom by the bung is now into the plumbing pipe as well, as it was scrap bit of pipe I didn’t care. With the bung removed I used POR Strip and painted it on the column which started to loosen and bubble the paint. I then used a rotatory wire brush to gently remove the paint. A final rub over with some wire wool made the job complete. The end result was a nice looking clean column cover. The top part of the column is the housing for the horn and indicator stalk. Again this was all chipped and will need to be colour coded. and can be seen in place from the pictures above. The electrical connection for the horn I have thrown away as the fitting was for a grant steering wheel. I won’t be putting the same steering wheel back on, as I will treat myself to a nice wood one. This collar section is in two parts and held together by two cross head screws. Undo the screws and the two halves will come away. Same method to clean the outside paint off was used. The inner section has a bearing/seal in the centre so be careful not to dislodge bearing unless you want to replace it. I gently cleaned the inside and degreased it. I also cleaned the fire wall grommet plate in the same way, but I will need a new rubber as it has been damaged by the under dash fire. In order to keep the metal from rusting apply some sort of seal to it. I used Gibbs Brand Lubricant and I know that will not rust with a coating of the bare metal surfaces and leaves a nice shine that wont dry like WD40 does. I was achin after that little stint.